John Fripp came to Carolina from England sometime between 1670 and 1690. A record was made in 1875 by E. St. James Fripp, who at that time was a Cotton Broker in Charleston. He said "the elder John, a widower with an only son also named John, came to America in 1670 with a Grant of Land on St. Helena Island. One brother William remained in England. The family there is represented by William Fripp of Bristol and W. C. Fripp, s/p of London Graphic." We have not been able to prove this by any documentation evidence extant. However, there is documentary evidence that shows John Fripp was living on St. Helena early in 1690. Fripp Island and Inlet was named for him. He purchased a plantation on Edisto Island in 1696 and registered his stock mark. He was administrator of the estate of Richard Frampton in 1699 and was High Sheriff of Colleton County in 1701. He was mentioned in an Act ratified June 12, 1714, apparently he was living on Edisto at that time. Records show he owned about 500 acres on Edisto and about 1,000 acres on St. Helena. His Will dated, May, 1742. His son predeceased him so his property was left to his grandchildren. "In completing this chart many of the same difficulties have been encountered as with most of the families who lived on the coast, both public and family records have been destroyed. This family lived chiefly in Beaufort and Colleton Counties ........... most all public records were lost. Therefore, the ........... and the possibility of making errors cannot be avoided." There are two things wrong with this writing. Other records show it was 1690 instead of 1670 when John Fripp 1st came to South Carolina with one son. I have given him the recognition as being the progenitor in America of this Fripp family. His son, John Fripp 2nd, was not more than 17 years old at the time. He lived on St. Helena island all his life as he and his family were members of the Parish Church of St. Helena, Beaufort, South Carolina, a Church of England from 1712-1789. This church is still a Protestant Episcopal Church (1789-1990). Records for this church are available and on microfilm at the LDS Family History Library, therefore, the last two sentences of the main paragraph (underlined) apply to his son John 2nd as he lived on St. Helena all his life and was living on St. Helena at the time of his death (buried 29 May 1742, age 61 years) according to the church records of St. Helena parish and his Will. John Fripp 1st, has been reported to have been granted 1,000 acres on St. Helena island. (Warrants for Lands, 1680-1692, Vol. 5, p 165, Carolina Hist. And Gen. Magazine.) A Book of Recording of Cattle Marks and others given by the Honorable Smith, Governor, on Feb 5, 1695 - "This day came Richard Boney (Benett) of Ffrips Island and recorded his marke for cattle & Hogs as followeth - halfe of ye Eares Cutt off & Two peaces cut out". Richard Benett was either the owner or the renter on Fripp's Island. According to the book, "Warrants for Lands, 1672-1711", Richard Bennett was given three warrants for land about this time. Records did not show where this land was located. In May 12, 1695 of the same book was the entry - "This day came John Ffripp & his Marke for cattle & Hogs wch is a Cropp & Hole in ye right eare & a Cropp and Slit in ye left, being formerly ye Marke of MacFashion upon Eldisto Island & by him assigned to ye s/d Ffripp for Cattle Y Hogs on ye sd Island of that Marke. - Test: Henry Wiginton." Further reports were found in SEA ISLAND DIARY, A History of St. Helena Island, by Edith M. Dabbs, The Reprint Company, Publishers, Spartanburg, S.C., 1983, Chapter X, Kingdom-by-the Sea. It contains the following information, word for word, p. 81: "The continuity of the Sea Island life-style was badly jarred by the Revolution and the resultant economic depression. Except for shifting agricultural emphasis, however, the physical appearance of St. Helena was little changed the first two decades when her planters were recovering from the effects of war. John Fripp's possessions covered not only most of the northeast corner of the island and by several locations to the southward along the eastern shore. He had also taken out or bought up other acreage diagonally across S. Helena on the southwestern shore along the river. But new names had appeared and as the old families absorbed the new it became very difficult to distinguish one from the other. By another generation, everybody seemed to be related to everybody else." "(There is a legend among some of his descendants that the first Fripp came from County Dorset, England, in 1670, armed with a grant from King Charles II, dated 1662, written on vellum or heavy parchment and carrying his seal). According to an old Fripp Bible, however, the first John Fripp was a widower who brought his only son John, to Carolina about 1690. This grant gave him an enormous stretch of land in the latitude of St. Helena, which runs through the island very near and parallel with the present Church Road. He also bought a large plantation on Edisto Island in 1696 and became an important and distinguished citizen there, serving as High Sheriff of Colleton County in 1701.)" On June 12, 1741, under Joseph Blake "An act of the General Assembly ratified, in Section 1, a road is ordered to be laid out from "John Frip's Plantation on Edisto Island to Wilton", and eight other roads. Reading in the records set up by the Proprietors for the founding of government by them, I found that to be appointed Sheriff one had to own at least 500 acres of land and five in that County. John Fripp 2nd could not have lived on St. Helena Island and been appointed a sheriff in Colleton County, another county near-by, as some descendants have written in their family history. This is another case where John Fripp 1st and John Fripp 2nd are not separated in time and place and the story treats John Fripp as one individual. Other records show that John Fripp 1st lived on Edisto Island in Colleton County and he also owned land on St. Helena Island. John Fripp 2nd lived on St Helena Island, in Granville County (later Beaufort County). Edgar Allen Fripp III of Georgetown has said that John Fripp of Bristol had emigrated to Carolina with his son in the late 17th Century, bought a plantation on Edisto Island in 1696. (See:	Mrs. Julienne Fripp - Moak Cronology - "The Rise & Fall of the Fripps in America"). John Fripp was a tax official 1720, 1721 on Edisto Island, Colleton Co. during the transition period from the Proprietary Government, MRF 021, MI5, (135). Records of the Secretary of the Province (1692-1700), "We, John Fripp, Thomas Bower and William Fry are bound unto Hon. Joseph Blake, Esq. Propr. And Gov., in sum of 2,000 (pounds), stg. D: 22 Mar 1688/1700. CONDITION OF OBLIGATION: John Fripp (1), administrator of estate of Richard Frampton, late of this Province, dec., made inventory of said estate by 3 freeholders to Office of Sec. Within 90 days after date hereof according to ....... Wit: Henry Wigington, p. 318". (This would have had to have been John Fripp 1st as his son was too young at that date). Will of WILLIAM SCOTT Colleton County dated 16 Oct 1712. Abstracts of the Wills of South Carolina 1670-1740, by Caroline T. Moore & Agatha A. Simmons shows John Fripp as a Witness. A Will for HENRY BOWER, Edisto Island, Colleton County, Planter, found under Miscellaneous Records 1722-1726, in a book Abstracts of Wills of SC, 1670-1740 by Moore and Simmons, shows John Fripp as a Witness. Probated 2 Mar 1732. Records Secretary of the Province 1709-1720. A MEMORANDUM: Warrant of Appraisement, was directed to Mr. John Fripp and three others, 2 June 1710, Vol. 23, p.142. "We, John Fripp, Thomas Bower and William Fry are bound unto Hon. Joseph Blake, Esq., Prop. and Gov., in sum of 2000 pounds stg. D: 22 Mar 1699/1700". CONDITION OF OBLIGATION: John Fripp, of estate of Richard Frampton, late of this Province, dec., made inventory of said estate by 3 freeholders to Office of Sec. Within 90 days after date according to ....,Wit: Henry Wiginton, p.318. (John Fripp 2nd was too young to do this). The above records and others show that John Fripp 1st lived on Edisto Island and was involved in all the processes of a regular county resident owning at least 500 acres and entitled to vote there. MEMORANDUM: Warrants of Appraisement was directed to Mr. John Eston, Mr. Jenkin Watts, Mr. John Fripp, Mr. John Haunes, Mr. Jeremiah Clark, or any 3 of them. Vol. 23, p.142. Records of the Province 1709-1721. Unless some record that I haven't seen shows such a grant by King Charles II to John Fripp I have serious doubts that one was ever given. Some records for John Fripp 2nd & 3rd. John Fripp (2nd) was on the Petit Jury, St. Helena Port Royal SC, MFR013/M/(57): Will of ANN IRWIN, Granville County, d. 11 Apr 1738, Prob. 10 Sept 1739, found in Abstracts of Wills of the State of South Carolina, 1670-1740, by Moore and Simmons show one Executor to be John Fripp, Sr. (He is John Fripp 2nd). (Extract): Will of John Fripp, Sr., St. Helena Island, planter, Wife: Sarah to live on my plantation ...... (Will Book 1740-1747): John Fripp, son of my said deceased son. Mentions: 2 grandsons William and Paul Fripp, land "upon my hunting Island." Exprs: Thomas Wigg, John Barnwell, John Edwards, and grandson John Fripp, 3rd. Wit: William Davis, John Evans, William Wiscoat, his mark D: 1 May 1742, P: 12 Aug 1743. R: 14 Aug 1744. P.180, and Abstract of Wills 1740-1744, p.30 Will Book 1747-1752. Will of JOHN EDWARDS, "Coldstio" Island, Colleton County. Wife: one-half of estate and at her death to "her" dau. Elizabeth Fripp, wife of John Fripp of St. Helena. Son-in-law: John Fripp ...... Execors: wife, son-in-law John Fripp, David McKee, Sr., Wm. Adams, Sr. Wit: John Hill, David McKee, W. Cook, Sarah McKee. D. 23 Nov 1747. P: 5 Jan 1749. R:nd. P.200. Will Book 1747-1752. Will of WILLIAM REYNOLDS, St. Helena's Island, planter. Wife: Eleanor, all land during her life, then to son and son-in-law Wit: Jno. Fripp (3rd) ...... D: 2 Nov 1754. P.28 May 1756. R: nd. P.532 (Will Book 1752-1756) (Same reference as above). Will of RICHARD REYNOLDS, his mark, St. Helena, Granville County, planter. Wife Mary land where I now live during her life Exors: son William; John Fripp (3rd) Wit: William Bassford ...... D 28 Aug 1753. P: 16 Feb 1759. R: nd. P.176 (Same ref. as above). There is a record of a John Fripp purchasing 400 acres of land on St. Helena Island from John Cowen who received it in a grant about 1699/1700 from the proprietors. This is the land that John Fripp Sr,(2nd) had his home and where he lived. In 1629 King Charles I gave grants of land in America to Sir Robert Heath. These grants covered all land between the 31st and 36th parallels from the Atlantic to the Pacific. Heath organized Proprietors to take over and govern this land but nothing was done at that time to prove up on this grant. In 1633-1665 King Charles II made a second grant to the Earl of Clarendon (1604-1674) and other favorites of Charles II. Limits of the colony extended from 29 degrees south to 36' 30" north. He organized and began selling shares to people with money and the Proprietors set forth to establish a government in the Colonies. The Proprietors received the territory by royal charter on 24 March 1663, and they moved at once to fill it with footloose farmers from Virginia, New England, and Barbados. The first permanent English settlement was at Albermarle Point in 1670. The first settlement at Charleston was in 1680. In 1682 the original three counties of Berkeley, Craven, and Colleton were created. Granville County, including St Helena's Island, was created in 1680. These Counties only served as reference points for locating the land grants, since all Court records were kept in Charleston until 1769. These included land grants, land and probate records. This was the seat of the Proprietary Government. In 1691 one governor was established over both North and South Carolina. In 1706 the Church of England became the established religion in the colony. The individual parishes then began keeping records of baptisms, marriages, and burials. Many of these records have survived and many of them have been published. I have spent considerable time researching documents that should have pointed to John Fripp getting a grant from King Charles II. Fourteen hours were spent in the stacks of the Suzzallo Library at the University of Washington carefully going through the indexes of all well indexed, volumes of the Calendar of State Papers - America and the West Indies covering the years 1661 through 1708. I looked for any record with the name Fripp, Bennett, MacFashion, and warrants, grants, deeds, plus the names of St. Helena and Edisto Islands. I covered such subjects as Crown Grants Proprietory Government, Beaufort English Colony, Pirates, Privateers, Spanish Ships. These are the detailed records of the English Parliament and would have contained some reference to John Fripp as portrayed in the legends carried down in the Fripp Family in South Carolina. There were no writings showing that King Charles II gave a grant to any individual except the one to the Proprietors. Secretary of the Province, Abstracts of Grants and Commissions of the Lords Proprietors 1692-1718 in the South Carolina Department of Archives and History. Records of Register of the Secretary of the Province, Vol.2, G in Greens Index, 1675-1695. SC Dept of Archives. Register of Province Conveyances, Vol.A, 1682-1690, SC Dept of Archives. Secretary of Province, Miscellaneous Records, Vol.2, 1675-1695, SC Dept of Archives Abstracts of Wills of the State of South Carolina 1670-1721, by Caroline T. Moore. Abstracts of Wills of State of South Carolina 1670-1740, CO 5/398, British Public Record Office, Microfilm, SC Historical Society. Narratives of Early Carolina 1650-1708 - A.S. Salley, Jr.
Warrants for Land in South Carolina 1672-1711. Journal of the Grand Council of South Carolina August 25, 1671 - June 24, 1680. Shaftesbury Papers and Other Records Relating to Carolina and the First Settlement on ye Ashley River Prior to the year 1676, Vol.V, 1897. Abstracts of Records of Secretary of the Province, 1692-1721, Caroline T. Moore. History of South Carolina first settlement in 1670-1818 by Walker, Evans Co. 1858, reprint. Records of the British Public Record Office Relating to South Carolina Vol.1, 1663-1684, by W. Noel Sainsbury, London. History of South Carolina by David Ramsey, MD, Vol.1, 1858. History of South Carolina Under the Proprietary Government, 1670-1719, 2 volumes. Gerhard Spieler, a researcher in Charleston, SC has gone through books he has on South Carolina Deed Abstracts, Wills Abstracts, and the Colonial Records of South Carolina Journal of the Common House of Assembly. He has not come across any record applying to John Fripp getting a grant from King Charles II. Warrants for Lands, 1680-1692, Vol.5, P.165, South Carolina Historical Society Genealogical Magazine. Unless some record that I haven't seen shows such a grant to John Fripp I have serious doubts that one was ever given. In "SOUTH CAROLINA BEGINS", The Records of a Proprietary Colony, 1663-1721, by Charles H. Lesser, South Carolina Department of Archives and History give us an overview of the problem with finding early records. A 1792 act of Parliament finalised the terms for the proprietor's surrender of Carolina to King George II. Except for the rich materials in the Shaftesbury and Locke papers and the 1663 charter at the North Carolina Division of Archives and History, all traces of the chartered group's other records vanishes about this time. The 1729 act appointed trustees to handle the legal and details of the transfer. The accounts for 1663-1666 and 1682-1691 that Sir John Colleton and Sir Peter Colleton placed in the back of two of the entry books are the only extended fiscal records for the proprietorship known to survive. The only surviving wills were of Woodward in January 1672 and six wills and zero records for interstate estates survive for the colony's first seven years. Surviving recordings of probate records began in earnest in 1678. However, the mention of saving these and keeping track of them was most haphazard for the next 20 years. The surviving rate for loose documents and the recording of wills was poorly handled and many were lost to posterity. Scattered around in many different offices were a surprising number of documents that were collected and indexed by the State of South Carolina. Several indexes of many documents survived and contain a wealth of information of what was lost. The first portion of this documentation is intermixed with other records in a volume that now bears the title "Records of the Secretary of the Province, 1675-1695". Many more wills than inventories survive in the books kept by the secretaries, but a significant percentage of the early wills went unrecorded. The devouring fire that struck Charles Town on the night of February 24, 1698, destroyed the original wills from the colony's beginning. The survival rate for loose documents is less than that of bound volumes, and the wills that were not recorded by the secretaries were fated to be lost to posterity. The bundles contained nearly 17,000 documents, and their loss is one of South Carolina's most grievous, but after 1721 recorded copies of more of the documents survived. When the Civil War started at Fort Sumter, in Charleston Harbor in April 1861, further destruction of documents were sure to follow. Lost during the State's Rights War and the Reconstruction nightmare . Another fire in 1865 resulted in the destruction of attritional more recent original Wills and Inventories. This may have happened during the occupation of Charleston by Union Troops. Work done by the, Civil Works Administration (CWA) and the South Carolina Daughters of the American Revolution and the Works Progress Administration (WPA) in the 1930's have produced typed copies of the full texts of three of the proprietary probate volumes from which the CWA extracted wills. These transcripts are available in the Genealogical Society of Utah on microfilm. Concerning King Charles II giving grants to John Fripp (1st) for land on St. Helena Island, I offer another reference of his life and the extent of his involvement in the Colonies during his reign. Consulting his biography in my copy of the Eleventh Edition (1910-1911) of the Encyclopaedia Britannica. There is no mention at all of King Charles II having anything to do with the Colonies in America. He was plagued with local and European politics, his mistresses, and his continued attempts to return the Church of England back to Rome. The Colonies were governed mostly by his Administrators and members of Parliament. He was given the last rites of the Catholic Church at his death bed on Feb 6, 1685 after a short illness. Throughout his life he continued the policy of double dealing and treachery, deceiving his ministers and intrigue with France and other foreign powers for the money it brought him. This does not indicate he would have ever bothered to give a Pirate John Fripp a grant for land not tied to the right of the Proprietors who governed the rights for grant property in South Carolina. The 1999 South Carolina Travel Guide has this to say about Fripp Island: Traffic is no problem on this controlled access resort island where bicycles, golf carts and feet carry more explorers than do automobiles. An ancient hunting ground for the Yamassee Indians, the island was acquired in colonial times by Captain Johannes Fripp, a hero in battles against the Spanish. Now it offers lodging, golf, tennis, unspoiled beaches, a marina and more. Fripp Island, a 3,000 acre wooded barrier island, is a place to shape up or slow down. Recreational facilities lure visitors who crave action, and tranquil subtropical beauty appeals to those who prefer unwinding at a leisurely pace. The Yamassee Indians didn't need a full-color brochure to entice them to come and hunt and fish on the island. Nor did the pirates who hid their plunder under the palmettos before sailing off into the sunset. During colonial times Captain Johannes Fripp, who risked his life protecting the coastal waterways from the Spanish was awarded the island in return for his efforts. Officially opened in the spring of 1964, a half million dollar bridge linking Fripp with Hunting Island was officially opened in the spring of 1964. It gives a direct link with Beaufort 19 miles to the east on the mainland. My daughter-in-law, Suzanne Blanchard Shore, enrolled her two sons, Chet and Mike, in a tennis camp on Fripp Island for two weeks during their early years. Suzanne's parents lived in Beaufort. Hunting Island has a State Park with a modern R/V and camping facilities. These are equipped with hook-ups and up-to-date set of restrooms, showers, toilets and hot water. Just a few hundred feet to the ocean shore with the sound of waves pounding the beach all night. My wife Mignonne and I stayed there for two nights when we were visiting Fripp and St. Helena islands. There are several books on sale in South Carolina book stores devoted to ancient tales and legends of the outer barrier islands and the pirate days. It seems as there are more legends connected with this lovely little island than any other on the South Carolina coast. The island had numerous Indian mounds, and various relics of the Red Man's occupancy have been recovered. It has been written that the Pirate, John Fripp, buried his treasure deep in the sands on Fripp Island at a location known only to him. Later when he needed ready money he would row over to the islands to replenish his coffers. Although several have attempted to locate this treasure, none have been successful. A modern tourist brochure carries this brief legend: "Captain John Fripp - the island's namesake - did little to secure a reputation for island hospitality .......... Whenever he needed funds Fripp allegedly took a helper with him and sailed to the island. He always returned alone. The writings of a grant from King Charles II dated 1662, written on vellum or heavy parchment that carried his seal found in previous references, apparently was a legend as well since I have found no substantiating documentation of this event. If there were any records of this in the Proprietary documents I have not been able to find them and if this story is true any record must have been lost or burned. Fripp Island is said to have been the favourite hideaway of that swaggering reckless pirate of the early eighteenth century, Blackbeard, who roamed the Colonial coast - especially along the Delaware, Virginia, and the Carolinas. Around Fripp Island were many ideal places to evade capture. Small winding creeks, inlets and rivers abound nearby. A high bluff made a perfect look-out. 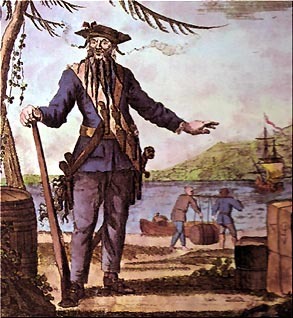 Blackbeard was born in Bristol, England but one seldom hears him referred to by his real name of Edward Teach. His nickname was due to the extraordinary quantity of jet black hair with which his head and face were covered. He was in the habit of twisting it with ribbons in small tails and turning them up about his ears. Somewhere beneath the sand dunes on Fripp Island, Blackbeard is thought to have buried many treasure chests. In 1708, he anchored off the Port of Charleston and there he plundered incoming and outgoing ships, taking as prisoners some of the important persons of the town. It was not a pleasant sight for the citizens of Charles Town to see the pirate captain's ship guarding their port, its black flag with its cross and white skull fluttering in the breeze. So when Blackbeard sent a messenger bearing a white flag to the settlement saying that he would liberate his prisoners and vacate the port in exchange for much needed medicine for his crew, the offer was quickly accepted. Early in the morning, in May, Blackbeard, wearing his usual 'three brace of pistols hanging in holsters' marched at the head of his men through Charles Town's streets, to obtain supplies. In the dignified old city, a tale is whispered that the high born, adventurous Miss O---- living in a large gray house near St. Michael's Church, waved gaily at the bold young pirate, who returned her greeting with a bow and a wide sweep of his hat. He exchanged his prisoners for medicine as promised, and on his way back to the ship, stopped for a moment where Miss O---- was standing in her gateway. Without a word, Blackbeard swooped her up and carried the frantic, struggling girl aboard the vessel. Immediately he set sail for North Carolina where his friend, Governor Charles Eden, married him to Miss O---- despite her pleadings. Then sailing to what is now called Fripp Island - where much of his treasure had been buried - Blackbeard left his wife there heavily guarded while he resumed his piracy of the high seas. From the research I have done to date I conclude that the stories written of a Johannes or John Fripp having been a pirate and of having received a grant from King Charles II are family legends that cannot be substantiated. Several of the family histories of John Fripp (1st) coming to South Carolina in 1690 with a son named John Fripp Sr. (2nd) have sometimes confused the father and son and have given credit to the son for events that were part of his father's life. I would ask that those who have records to dispute my findings to write me and send along a copy of the record. I will rely on Frank Phripp of St.Clements, Ontario, Canada and Richard D. Fripp II of Walnut Creek, California to examine this document and write me with any additional information they have.